This page contains miscellaneous posts from my short-lived blog Symbolism. The math-related posts are collected here. The Bluetooth wireless communication protocol is named in honor of Harald Bluetooth who united rival Danish tribes into a single kingdom around 970 AD. The Bluetooth logo concatenates the Nordic runes for Harald Bluetooth’s initials H (ᛡ, U+16E1) and B (ᛒ, U+16D2). According to legend, the use of a V sign as a symbol of victory goes back to the Battle of Agincourt (1415). It is said that the French would cut off the first two fingers of captured archers, and so English and Welsh archers would hold up these two fingers to show their defiance. 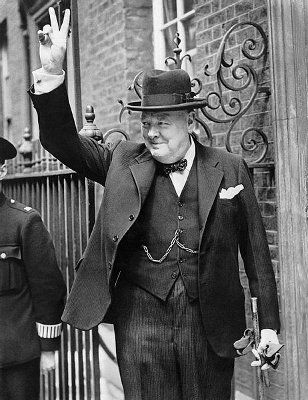 During World War II, the Allies adopted the V sign, popularized by the BBC’s “V for Victory” campaign. Winston Churchill often used the sign during the war. In the 1960’s, the sign became known as the peace sign. The victory sign is a dingbat in Unicode, VICTORY HAND (U+270C). Whether used as a sign of victory or peace, the sign is made with the palm facing outward. When the palm is facing inward, the gesture represents the number 2 in ASL and is an insult in the UK. This reversed victory sign was added to Unicode 7.0 as REVERSED VICTORY HAND (U+1F594). According to Eusebius, Constantine the Great had a vision of the chi-rho in the sky before the Battle of Milvian Bridge in 312 AD and heard the words “in this sign conquer.” (These words are famous in their Latin form, In hoc signo vinces.) The symbol is formed by the Greek letters χ and ρ, the first two letters of Χριστός, the Greek spelling of Christ. There are various accounts of Constantine’s vision. It’s difficult to separate history from legend at this point, but archaeologists have found the chi-rho on coins and Roman helmets around the time of Constantine. The Unicode code point for the chi-rho is U+2627. APL is a programming language developed by Kenneth Iverson in the 1960’s. The most infamous aspect of the language was that it introduced a large number of new symbols that required a special keyboard to input. Unicode characters U+2336 through U+237A are all APL symbols. APL was not widely used, but it was nevertheless influential. Programming languages have been very reluctant to introduce new symbols, and many point to the fate of APL as evidence that new symbols will not be accepted. I argue elsewhere that APL should not be used to justify extreme caution in introducing notation. APL required a special keyboard to input. That would no longer be necessary. APL also introduced a new programming model; the language would have been hard to adopt even without the special symbols. Finally, APL’s symbols were completely unfamiliar and introduced all at once, unlike math notation that developed world-wide over centuries. The ankh, Unicode symbol U+2625, was an ancient Egyptian symbol for life. The origin of the symbol is uncertain. 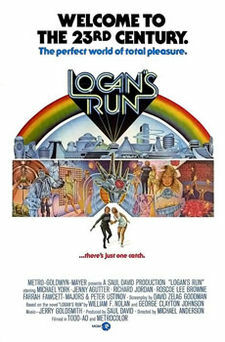 The ankh entered pop culture in 1976 when it was featured prominently in the movie Logan’s Run. The caduceus is the staff of Hermes in Greek mythology (Mercury in Roman mythology). By extension it symbolizes the planet Mercury and activities associated with Hermes/Mercury such as commerce and negotiation. Contrary to popular belief, the traditional symbol of medicine is not the caduceus but the Rod of Asclepius, the Greek god of healing and medicine. The Rod of Asclepius has a single snake wound around a rod and no wings. The Star of Life symbol associated with ambulances and emergency medical technicians has the Rod of Asclepius, not the caduceus, in the center. The Unicode code point for the caduceus is U+2624. When used as an alchemical symbol, the caduceus has a separate code point U+1F750. The Rod of Asclepius is U+2695. Latin had no th sound and no letter to represent it. So scribes in the north of England began writing Old English with Latin letters, they first used the letter d to represent the th sound in their language. Later they developed the letter eth (uppercase Ð, U+00D0; lowercase ð, U+00F0) to distinguish this new use of d from the ordinary use of d. Scribes in the south of England invented the letter thorn for the same purpose (uppercase Þ, U+00DE; lowercase þ, U+00FE). Some scribes would eventually use both eth and thorn. Both eth and thorn survive in Icelandic. The HTML entities for Ð and ð are &ETH; and &eth; respectively. Similarly, the HTML entities for Þ and þ are &THORN; and &thorn; respectively. For more on the development of the English alphabet, listen to The History of English Podcast. which translates as Jesus Christ, Son of God, Savior. The symbol may have been inspired by several references to fish in the gospels. For example, some of the earliest disciples were fishermen.